Drugs in China: Authorities crack down on expat dealers in Beijing. Inside the Chinese capital’s expat underground. Police officers catch a foreign drug dealer in a campaign in Sanlitun, a popular Beijing bar area, on May 24, 2014. BEIJING—Rob takes a puff of weed from his glass pipe. He turns off his flat-screen TV and prepares to head out on a “special pharmacy” run. Outside his apartment, he walks to his dark motorcycle, mounts the bike, and drives 10 minutes to a location outside Beijing’s Fourth Ring Road. Rob sells Percocet. Today he’s heading out to a pharmacy to get a fresh batch. Yesterday he bought six boxes from this location; now he’ll try and purchase six more. He’ll then resell the individual pills to the 30 or 40 expat patrons who make up his client base. He also offers customers marijuana and other prescription painkillers. He pulls into a small street shaded by aging Soviet-style buildings. He walks into a ground-floor business and asks the sales clerk for tai le ning, the Chinese translation for Percocet that sounds suspiciously similar to Tylenol. Chinese Premier Li Keqiang might describe Rob’s business as a “common enemy to humanity,” but the women at the pharmacy don’t seem threatened. “The foreigner knows about tai le ning!” says one, laughing. She sells Rob the six boxes and hands him a blue and white plastic card. The card is good for discounts, the middle-aged woman explains, and now Rob is guaranteed a more than 50 percent cut on everything he buys in the future. In China’s capital, drugs are surprisingly easy to obtain, often sold in alleys surrounding Sanlitun, a popular bar area, just blocks away from a police station. Beijing officials have been trying to tackle the city’s growing drug problem for years, often targeting foreign dealers and users. In 2012, American James Chen was arrested, deported, and eventually banned from China for selling marijuana to a small group of expats. From 2006 to 2010, the number of foreigners incarcerated in Beijing nearly quintupled, according to annual volumes of the Beijing Prison Yearbook. Their most common reason for imprisonment is drug trafficking. In August, Beijing police stormed the 2 Kolegas bar, a music venue popular among the city’s internationally minded crowd. A dozen police officers made all the patrons provide urine samples before they could leave, forcing some 50 people to squat in port-a-potties with the door open. The officers then held the small cups up to the light, eyeing the urine for the foggy or flecked signs of marijuana use. Wild colored trees outside a drive-in movie theater next to the 2 Kolegas bar where the drug crackdown occurred in Beijing on Aug. 9, 2014. The 2 Kolegas raid clearly targeted foreign drug users. Of the 10 who tested positive for marijuana use that night, five were foreigners. They were taken outside the bar and made to sit on the ground, their hands tied behind their backs and heads down. Some had their mouths taped shut. Once everyone had been tested, the foreigners were thrown in police vans and shuttled to the Shuangjing Police Station for a 24-hour-long interrogation. The police confiscated their passports, and the accused spent the next two weeks in a detention center. Once those 14 days passed, the five “failed” foreigners—the two Italians, one Frenchman, one South African, and another whose nationality remains unknown—were put on flights back to their home countries. No time was made for packing or farewell parties. They were banned from re-entering China for seven years. Part of the appeal of life in China involves precisely the malleability of rules that, when abused, create the impression of a system that is rigged. People get around rules and find ways to live with them. No one wants them to be applied too rigidly. But as police interest has shifted to arresting higher-profile drug users such as celebrities and foreigners and as the penalty for violating China’s strict no-tolerance rule has increased, the larger question of what’s behind this crackdown remains. During the past decade, China’s drug market has expanded rapidly. According to a 2006 paper by Niklas Swanstrom, a security expert at Sweden’s Uppsala University, China has become “an important nexus in the narcotics trade, both as a consumer, as a transit route, and a source for the export of precursor chemicals” to neighboring countries. The most popular drug is ketamine. The dissociative anesthetic is known universally for rendering even experienced users incapacitated, sending them to spaced out “K-holes,” as users call them. Consumers often experience vivid daydreams and a profound sense of worth, even in the middle of a Lady Gaga track. “We have been high overnight, can’t get a taxi to be back now,” a ketamine user going by the name Rickey posted on Sina Weibo, China’s Twitter-like messaging forum. The girl had spent the night with friends at a karaoke parlor. The next day, she posted pictures of herself and her friends online. Local police saw the pictures and called for her to turn herself in to authorities. The 17-year-old was later detained. Using ketamine at karaoke parlors is not uncommon in China. But 2 Kolegas proved a strange choice for a drug raid. The alternative music venue is located well outside the center of the city. 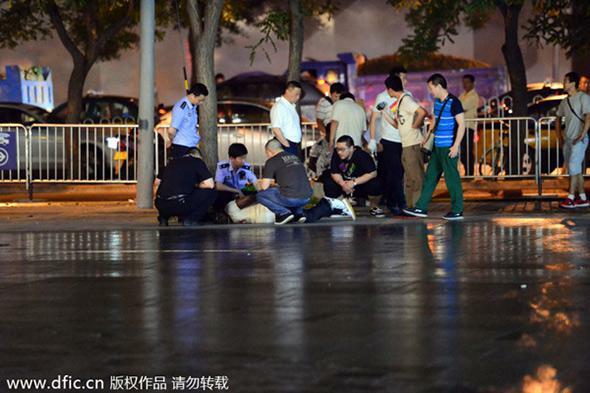 Many wondered why officers hadn’t targeted the Sanlitun neighborhood, a raucous bar area where drug use is more common. Lined with multilevel buildings filled with bars and clubs and street-side vendors selling 4-yuan beers, Sanlitun has long been under the threat of demolition by the authorities. Police aren’t blind to the area’s decadence; they just chose to ignore it that particular August night. In late May, officers targeted a group that had formed a “circle of trading” in the area. More than 30 alleged drug dealers, all foreigners, were arrested on one rainy Monday night. The state-run newspaper China Daily ran an article with pictures the next day, featuring police pinning a handcuffed African “dealer” to the ground. “The way I see it, you’re either the butcher or the cattle,” Rob says, describing his business. (Rob’s name has been changed to protect his identity.) He prefers the term “seller” instead of “dealer.” He believes his narrow client base makes him small-time compared to the business his African suppliers conduct. In his mind, you’re either the one selling—and often overcharging—for the pain pills and marijuana he stocks—or you’re the one being overcharged. He says the real dealers are the African men from whom he buys marijuana. The New Yorker arrived in Beijing in late February 2013, through the kind of crooked “Teach English in Beijing” company that many foreign teachers in China encounter. After four months working at a private kindergarten in the city, it became clear to him that his company was pocketing more than two-thirds of his paycheck each month (about $2,000). Frustrated, he decided to supplement his income the easiest way he knew how. Rob had experience selling marijuana. He started when he was 17 and had been hustling in one way or another ever since. At his prime, in the U.S., he claims to have had more than 25 “small-time” sellers working under him. He earned $3,000 per week. Back then, Rob called himself a drug dealer; he paid his $38,000 annual college tuition by selling marijuana. 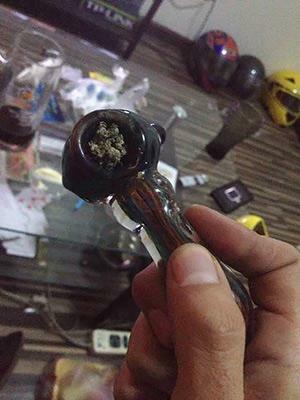 Rob holds his glass bowl, filled with marijuana. The two completed their transaction and established a relationship in less than five minutes. Eventually, the ease and friendliness of this contact added to Rob’s decision to start selling again. During his first six months in Beijing, Rob sold marijuana to between 10 and 15 regular customers. Then he found a “special pharmacy,” where he could buy codeine over the counter. He added that to his list of products. About a year later, he discovered Percocet, morphine, and oxycodone at the same pharmacy. Now, pain pills are the most popular items he sells, especially the Percocet. He prices pills at 5 to 30 yuan each, depending on customer naiveté. During one especially fruitful week he sold 1,000 tablets. Despite the crackdowns, his side business is flourishing. “The Africans, they’re incredibly paranoid,” he says. “There’s not as many as there used to be back in Sanlitun. I’m more accessible” There are 47 Nigerians at Beijing No.2 Prison, the most of any foreign nationality. Most are suspected drug traffickers. One of Rob’s most reliable suppliers has disappeared. He has stopped answering his phone. Before Rob runs to his “special pharmacy” that Tuesday, he relaxes on the first floor of his Beijing apartment, leaning back into his computer chair. An episode of It’s Always Sunny in Philadelphia blares in the background. It’s the one where the gang pretends to be police officers and write fake parking tickets to citizens of Philadelphia. Eventually, the real police catch them, but there’s no punishment. After 22 minutes, the gang goes back to getting drunk and living their lives, just like they always do.